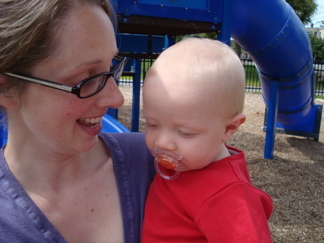 In which our heroine introduces her son, Dash, to the slide at the playground across from her old house. Dork Mom is excited. DM: See Dash? Slides are fun. Look… weeeeee. DM: Silly baby. Come with me and I’ll show you just how fun slides can be. DM: he he he, sorry baby! Mommy should have remembered how clutzy she is and not tried to slide with 16 extra pounds in her hands. he he he. Kiss kiss. Dash: Don’t ever do that to me again. I will kill you. This entry was posted on Wednesday, August 22nd, 2007 at 11:34 am	and is filed under Dashiell, Dork Mom. You can follow any responses to this entry through the RSS 2.0 feed. You can leave a response, or trackback from your own site. No, no – you’re showing him how to take a tumble and just brush it off – to live to slide again! This is good. 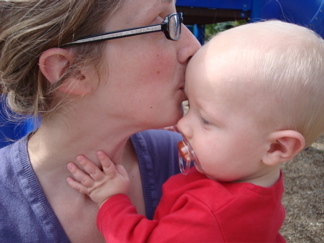 Dash may come to love the slide, unlike his sweet mom, who preferred to stay on level ground til she was about 14. This may help explain why I couldn’t use the slide like a normal person. hmmm. shades of Britney Spears here, baby dropping and whatnot. Does that make Neil Kevin Federline?